Summary: This is my favourite handheld sharpener. It is well designed, easy to hold, performs double duty and its weight means that it doesn't get lost easily. The compact size also means it fits easily into pencil cases. Replaceable blades mean that it can be used over the long term. It's not cheap, but there again it's not that expensive. Manufacturer / Distributor: Unknown. It's marked "M + R Germany"
(UK) L. Cornelissen & son (London) - where it is known as the Brass Nugget Pencil Sharpener £4 (View the the Drawing Gums and Resins PDF file - view the PDF file click here. I have problems with using hand held pencil sharpeners because of my tenosynovitis in my sharpening hand and yet I seem to be able to use this one without problems. Maybe because it sharpens well first time? Summary: I've tried two and neither have worked properly. I've also heard from a fair few fellow pencil artists of various degrees of experience who have also tried this sharpener and also had problems. I'm not happy and I know Derwent is trying to find out why the problems are happening. This is NOT a recommended purchase. Who should buy this? A difficult question. In principal, it has the scope to be an ideal pencil sharpener for those wanting to be able to transport a helical pencil sharpener outside the home or studio (eg to class or into the field). On the other hand it's not that light or compact and the problems with usage suggest it might be better to wait until Derwent have at least got the latter fixed. Who should not buy this? Anybody wanting a needle sharp point quickly and every time they insert a pencil. The best bet for this is a mains powered helical sharpener. I've held off from reviewing this sharpener for a while as it was new to the market and there seemed to be some teething problems. However I'm continuing to hear about people who are having problems with this sharpener (notably one tutor who got several for a class and then found that 10 out of the 12 were faulty in some way) so I've decided it's about time I did a proper review. The first one sent to me for review by Derwent failed to work at all and had to be sent back. I spent ages inserting the batteries, trying them in diffierent configurations, finding a different set of batteries, repeat as before etc etc. It was very frustrating but Derwent were very helpful and sent me another one to review. The design and practical issues that I noted at the time (quite apart from the fact it didn't work were as follows. The batteries required are described as 4 x 1.5V AAsize UM3 batteries. I've never heard of UM3 batteries. Google suggests they are batteries used in the USA. The standard batteries that I use for virtually all my needs are always described as AA LR6 batteries. Design wise, the polarities information relating to inserting the batteries correctly is a lot more difficult to detect than on alternative brands of battery powered sharpeners. You need a very good light to see them on the inside of the battery cabinet (ie black on black in a dark space!). Finally I also found them on the underside of the lid of the battery cabinet - which is not where the leaflet says they are. I gather there has been some suggestion of 'battery-related' problems but I don't know whether this is due to people not using the right batteries, not being able to work out how to get them in correctly or just bad connections I don't know. What I do know is that there are too many different ways of failing to get the batteries to operate properly! Shavings bin: The shavings receptacle didn't give me a lot of confidence that it would stand up to a lot of removal and reinsertion. It's only got one tiny plastic tab (very easy to break) and it doesn't have a nice 'click' when put back in place - which always worries me when there's scope to dump pencil shavings everywhere. Helical pencil shavings are also a total nightmare to clear up due the fact they are so very fine. I really like shavings receptacles which are very easy to pull out and slot back first time every time - and this one didn't. Plus being able to see easily where to slot them back makes the chances of getting it right much more likely. My view was that there's quite a lot of scope for design improvment in this area. Cleaning brush: It comes with a brush for cleaning out the helical blade but I wondered at the time how long it would be before it was lost. I started off keeping it in the shavings receptacle but now can't find it! If it had a gripper (maybe underneath?) which kept it with the sharpener it would be a much more practical idea. However we've all got ready access to brushes for performing the same task so one has to question whether it's really necessary. This is already an expensive sharpener and if I were Derwent I'd be looking for ways of making it more cost competitive. Size and weight - it's nice and neat if used at home. However the only real reason for having a battery powered helical sharpener is to use it out of the home and 4 AA batteries do not make this nice and light to carry around. There must be a way of creating portable battery powered sharpeners which use smaller lighter batteries! It's also more bulky than the Panasonic battery powered helical sharpener I bought from Staples in the USA which I have used as part of my sketching toolkit. Instructions: Text on the instructions is completely unreadable by me even with my reading glasses. It's far too small and fails all accessibility vision tests for people with vision impairment. Lots of recreational artists are rather older and more likely to have impaired vision re reading. I'm in my mid 50s and needed a magnifying glass to read what the instructions said. 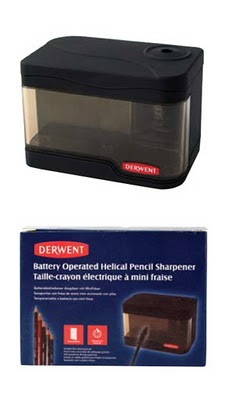 In addition, the hole does not seem to like the larger Derwent pencils - a problem which happens often with other sharpeners but one would have thought would not occur with a sharpener that has Derwent's name on it. The second sharpener Derwent sent me to test worked - but wouldn't produce the very sharp point that I associate with a helical cutting blade. You can see thre results in my comparison test picture. I took two blue Derwent Coloursoft pencils and sharpened the Indigo one in the battery powered sharpener and the Prussian Blue one in the mains powered helical Jakar Electric Pencil Sharpener which I reviewed on Monday. As you can see there's quite a difference in the points achieved. The very sharp point produced by the Jakar is perfectly possible in any helical sharpener - if they work well. This one does not. Below is a picture of a test I did for this review this morning. It proved very difficult to get a decent fine point. When I realised how much time I was spending trying to get a point I realised that it's actually quicker and simpler to use a manual sharpener. The sad part of this review is that Derwent produce a lot of good quality merchandise and I'm very disappointed to be having to write a review like this. However this time Derwent seem to have commissioned a sharpener which is not performing well for a number of people. I've heard from leading artists and others to the effect that they have given up on this sharpener. It does appear to be working for some people but the sheer fact that so many people have been making adverse comments makes me think it's time for a radical rethink. What I would say is that Derwent were very pleased to get feedback from me about the sharpener. I told them I'd heard of similar complaints from others but did not 'name names'. So if you've got one of these and you've had problems can I suggest you get in contact with Derwent. I'd recommend using the website enquiries form and addressing your comments to Barbara Murray who is the Technical Manager at The Cumberland Pencil Company at Derwent House in Cumbria. ideally make it a lot lighter by using batteries which are lighter if that's possible given the load requirements. make it a lot more compact if targeting the portable market. It's bigger and bulkier than alternatives and hence more difficult to pack. make the polarities for the batteries crystal clear. Black on black is a really bad idea! My bottom line standard for this is that I should never ever have to peer and scratch my head before finding a way of shining light on the subject so I can see which way round they need to go in! Test models with people with poor vision. For the record my alltime favourite for battery powered helical pencil sharpeners is the Panasonic KP 4A - see my website for comments and picture - it does the same job but is much more compact and hence I've used it a lot while travelling. Whereas I think I'd think twice about taking the Derwent one. Summary: a very efficient and effective pencil sharpener which can, with care, be used with coloured pencils. Needs to be fed pure graphite sticks periodically to be kept really happy. It works well with all brands of pencil. I find the oil based brands achieve the best points. 3.3" x 4.3" x 6.5"
Who should buy this? 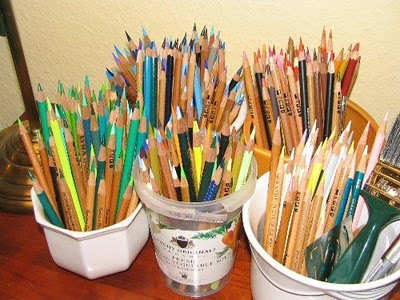 : Dedicated pencil artists and anybody else requiring a sharpener which produces a very sharp point time and time again. Who should not buy this? Hobby artists who've not yet decided whether or not they want to pursue pencil art - simply because although it's invaluable to the pencil artist, it is also expensive as well. Wait until you've got the pencil bug - and then it's a good investment. mains-powered hence not as green as hand sharpeners - and you've got no sharpener in a power cut! always manages to cut out just before you you start to sharpen the pencil you need to use right now! 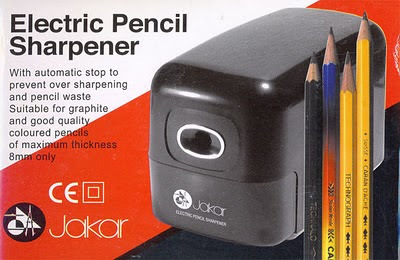 I bought my very first Jakar electric pencil sharpener in 2004 for £25.99. When I was in hospital having a major operation in 2005, I missed it so much that I asked "he who must not be bored while I sketch" to bring it in so I could carry on drawing through my recovery! The consultant was greatly intrigued! This sharpener got a real "power user" battering from me over the course of three years and started to have problems no matter how many graphite pencils I fed it! In 2007 I started to get worried about not being able to find a new one as I very rarely saw it in shops and I was also very concerned about the cost of postage for such a heavy item. So while at the Art Materials Fair at the NEC I took the opportunity to buy two more for £26.95 each. One of these has been battered and I'm now using the second. This sharpener has a helical cutter (not a blade cutter). This is much more effective than a blade and produces excellent long needle points on coloured pencils (see right) and the finest wood shavings you've ever seen. The results in part depend on the brand of pencil you are sharpening. My personal view is that the oil based brands (Faber Castell Polychromos and Lyra Rembrandt) achieve the best results in terms of points. Once you get this sharpener you'll discover an urgent need to sharpen your entire pencil collection as you marvel at the points it can achieve! You can see mine on the right after my first encounter with this sharpener. This is also when you discover that it has a thermal cut-out feature. This cuts in (and stops the sharpener)if you start to overload it by sharpening too many pencils one after the other. The sharpener also refuses to sharpen when the shavings box is full. The box now says it's suitable for use with good quality coloured pencils of up to 8mm thickness whereas previously it used to say it couldn't be used with coloured pencils. It's probably still the case that it always benefits hugely from being fed a stick of graphite on a regular basis. This cleans and lubricates the cutter area which can get clogged up with waxy pencils. The only drawback with this sharpener is that it can gobble pencils if you're not careful. On the other hand it cuts pencils much more effectively and consequently puts less strain on the pencil and they are less likely to break or contort in the sharpener. Recommendation: I highly recommend the Jakar mains powered pencil sharpener with the helical cutter blade. My recommendation is guided by three facts - I like sharp points and I've got tenosynovitis which limits my capacity for hand sharpening. It also may seem expensive but the reality is that one of these lasts far longer than other sharpeners for artists who are need a sharpener which can cope with heavy duty pencil sharpening. I've commented previously on pencil sharpeners on Making A Mark - but most are old posts. This week and next I'm going to do a series of posts about pencil sharpeners of different types and brands. If you've written a post about pencil sharpeners do let me know. I moderate a Flickr Group called My favourite art shop. The idea is that it a place where fellow art shop enthusiasts can share photos of their favourite art shops. Good art shops can be really hard to find and and my experience is that it's getting more difficult all the time to keep track of the good ones. However devotees will travel miles to visit a good art shop! Let's also not forget that patronising good local art shops will hopefully keep them from going under during the downturn. The idea is this Flickr group is a sort of cheerleading group for really good art shops. Mediocre shops don't get a look in! Experienced art shop detectives can often tell from looking at pictures whether this is the sort of art shop they like the best. The pool of photos may therefore provide an incentive for a future visit by an artist - even if the shop is in another country! Or maybe for other art shops to improve their standards of stock and display? 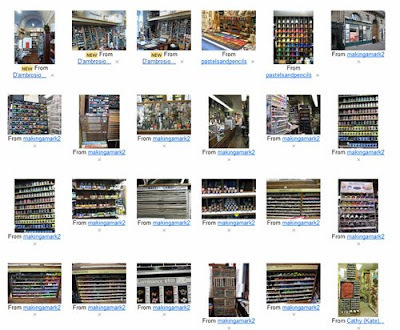 I like to see photographs where people explain what we're looking at and a little about the type of art materials which are kept in stock. 2) promote an art shop that you have any sort of commercial relationship with - eg as an owner, member of staff or an affiliate. If you've posted on Flickr about your favourite art shop and would like to share your photos in this group you can send me a message on Flickr (to makingamark2) to get an invite to join. 1) by art shop owners, art shop managers or affiliates of any art store to promote their store for commercial purposes. You probably reacted the same way as me when you read the headline. It certainly made me open my email. 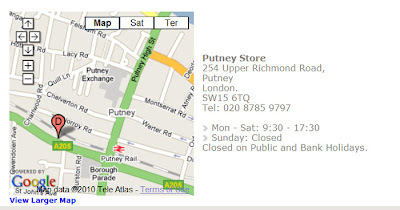 It turns out that the London Graphics Centre - which has four art shops in London - is closing down its Putney branch at 254 Putney High Street. If you can get to the store you might be interested to know the offer is 50% discount off EVERYTHING between now and the end of March. The store is very focused on serving the graphics community as well as artists and their stock reflects this fact. However this is a sign of the times. B&M retailers of art materials are heavily under pressure from online suppliers - and even more so in a recession. Art stores need to keep on top of their overheads right now if they are to stay competitive and in business. In such situations retail outlets always tend to get 'shaved'. However online suppliers would do well to remember that if all B&M stores went out of business there'd be a lot fewer spur of the moment purchases which lead to longer term purchases online! I've found over the years that LGC leans a bit too much towards graphic supplies for my taste. They stock good quality art materials from reputable manufacturers but they can be a bit boring and really aren't in the same league as Green & Stone or Cornelissons (see My Favourite Art Shops - Resources for Artists) when it comes to salivating potential! Roz Stendahl (Roz Wound Up) has been testing Stonehenge Paper. This post links to her various blog posts this year on this topic. As a preamble I'd like to emphasise that although it is used by artists for a variety of purposes, Stonehenge is actually a printing paper. Consequently it can't be expected to behave in the same way as, for example, a specialist drawing paper or watercolour paper. It's technical specification (sizing etc) is designed for getting the best results when using fine art printing methods. Nevertheless it is used by artists for artwork other than fine art printmaking as the reviews cited by Legion Paper indicate. I've extracted some comments to give you a flavour of Roz's views. However each post is a detailed review and I really do RECOMMEND a proper read of each post if you use this paper or are interested in this paper. You can also click the images in each post and see a bigger image of the tests done. Bear in mind that Roz's aim in doing these tests was to identify a good quality paper for art journaling which was readily accessible and which her students could use in a variety of ways. Stonehenge Paper: A Test in which Roz sets out her objectives and why she is testing Stonehenge. Historically I have not been fond of this paper. A friend even made me a button featuring my distaste. 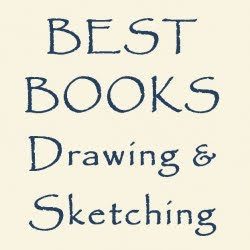 But I'm eager to find something workable for students just getting into visual journaling who don't want to spend $5 or more for a sheet or paper..............Several friends who work with graphite, however, love this paper and are always singing its praises. Printmaking friends tell me how much they love this paper. I know this is a well-loved paper. Keep in mind that my comments are meant to alert you to characteristics of this paper that may matter to you in the way you bind books or work in your visual journal. Something that I find might be a negative characteristic might be just the characteristic you're seeking. In general I find watercolors, gouache, and acrylic to look flatter on this paper than on other printmaking papers I've painted on. Flatness of color is to be expected on a printmaking paper when using watercolor inks as the paper isn't sized to hold the ink floating in the sizing like a watercolor paper. These two results: the soft paper taking an impression of what should be only light lines, and the rubbing off of non-smudgeable media such as ink on the previous pages are DEAL BREAKERS for me. For me, the dissatifactions of working on this paper, even with simple work-arounds and adaptations to approach given a specific medium, leave me uninterested in working with this paper in my visual journals at this time. I'll give it another try in 5 to 10 years! This also means I won't be using it in my classes, even though it is so affordably priced. While I want to find my students "deals" on materials, my first priority is always to provide a successful experience. I found that the paper was resistant to blending and it was no fun to push the pencil around on this paper. I use light pressure and even with light pressure I found it difficult to cover change of direction of previous strokes, and in the areas that I worked for full coverage (negative space beneath the dog) pilling and slickness quickly appeared (something I don't like in my colored pencil drawings.) The paper had little ability to hold the light layers I like to use to build up my colored pencil drawings. I'm sure you will agree that Roz gave Stonehenge a thorough 'going over'. It's not her paper of choice for journaling however that doesn't mean to say it's not a jolly good paper when used for other purposes. This blog is not dedicated to my own product reviews - it's about widening our collective knowledge of what's out there! I'd be very interested to know about posts by anybody else who has been product testing. Do let me know if you think you've done posts on your blog which you think I might be interested in.